@Yungskeeme I am not a lawyer and have no experience with Maryland courts, so I don't know how common it is for a motion to compel arbitration to be decided at a hearing. If I understand you correctly (since we haven't seen any of your drafts, right?) you've only written a "demand for arbitration" and sent it to the plaintiff's attorney, not filed a formal motion. Did you receive any response to your arb demand from the plaintiff's attorney? If not, I might suggest you include this information in your motion to compel, along with a fact-descriptive paragraph in an affidavit and a copy of the arb "demand" letter, noted as a true and correct copy and marked as an exhibit. This step would demonstrate to the court that your attempt to move to arbitration without involving the court was ignored. @fisthardcheese or @Harry Seaward may have a different opinion, but if I were in your shoes, I'd include in your motion the "Request for Hearing" under a separate heading as your rules require--if those are the rules of your specific court. The plaintiff needs to file a written response to your motion if they oppose it. In that case, having requested a hearing will come in handy. If no response in opposition is filed, the court may grant your motion by signing the order included with your motion papers. On February 4th I mailed my MTC, along with the card agreement and copy of the letter for Demand for Arbitration to the court. (I am not a lawyer.) Every court I'm aware of requires a sworn statement or form called a certificate of service to be filed with the court to ensure that a copy of the filed motion was sent to the opposite party. Wait, you've already filed a claim demand with JAMS? Yes. I wasn't suppose to? @Yungskeeme This is @fisthardcheese 's advice from his pinned thread on Arbitration. I'm sorry, I assumed you'd read this. Fist has recommended that the JAMS or AAA claim demand forms can be printed and pre-filled out, but not actually submitted to AAA/JAMS, and brought to the motion to compel hearing to show the judge you're ready to go once the motion is granted. "Getting a granted MTC is like a golden ticket against a JDB. This should be ALL that you focus on in court. When you file the MTC you essentially put a wrench into the JDB's auto-pilot lawsuit mill. The ONLY question now before the court is whether there is a valid arbitration agreement between the parties (you will show that there is with your card agreement and affidavit). And if there is found to be a valid arbitration clause, then according to case law (from state and SCOTUS), then the court MUST order arbitration. This is the one and only issue that should be covered in court. AFTER the court grants your MTC and orders the parties to arbitrate, then you should move on to actually filing the case in arbitration." Damn. Hope this doesn't mess anything up. No apologies needed. I did read his post. Got stuck on doing my MTC so looked at another post someone posted their sample. Guess I was pulling from both posts. Hope this doesn't mess anything up. As I see it, the biggest problem you have is that you did not provide a copy of your motion to compel arbitration to plaintiff. The rules and basic fairness require you to allow them time to submit a motion response for the judge to consider prior to ruling. Once you've sent the copy to the plaintiff, I'd suggest you also file that certificate of service with the court asap. If you want to request a motion hearing, you'll have to do as the court rules state. A copy of that request has to go to the plaintiff as well. You have filed your demand with JAMS. At some point you will receive notice to pay your consumer filing fee--unless you've already done so. I have no idea how slowly your court operates. Ideally, you'd like to have a motion to compel granted and the judge's order before your JAMS case is closed due to non-payment. Fisthardcheese is the expert on this, not me. Will do. Mailing the MTC to the attorney tomorrow and will figure out how to write up the Cert of Service. Thanks. Update when I have one. will figure out how to write up the Cert of Service. You will just have to deal with both JAMS and the Court at the same time, now making it a little more stressful than it needed to be. JAMS may attempt to close the case due to the JDB ignoring them until the MTC is granted. You will just have to respond to that by asking JAMS to give you 30-60 days to get a court order to arbitrate. So an update. There was an issue with my postage so the court didn’t receive my MTC when I mailed it on 2/7. Attorney responding with something about staying until it goes into arbitration. Still haven’t heard anything from JAMS. Checked yesterday online and the court has my MTC and the judge is to review it on 3/7 (per the clerk I spoke to). 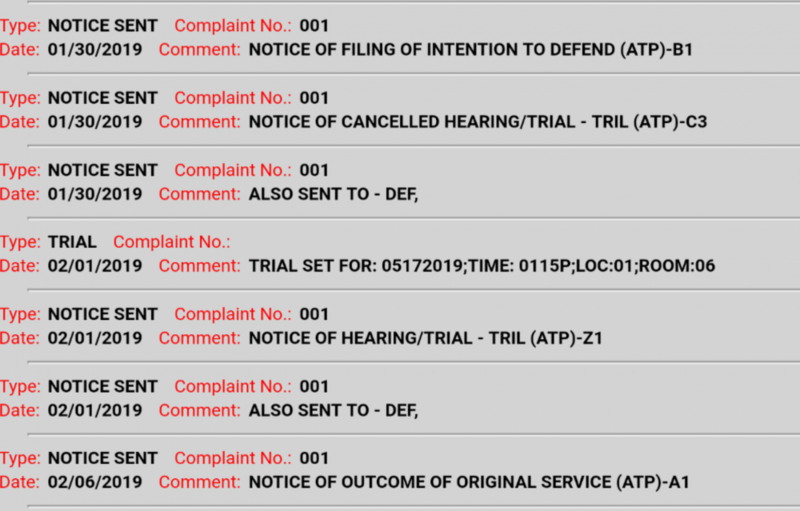 Stated I don’t need to request a hearing to get the decision on my motion. Plan to call the day after to find out the status. Probably call JAMS as well and find out what’s going on. Contacted JAMS after not hearing anything. Mailed my Demand in Arbitration form to them on 2/7. Someone contacted me and said they will correspond with me and Midland via email and mail. Tomorrow my MTC is due to be presented to the judge. Fingers crossed it gets granted! Tomorrow my MTC is due to be presented to the judge. Fingers crossed it gets granted! Best of luck to you! Let us know the blow by blow. Got an email regarding arbitration. Notice of intention to initiate arbitration from JAMS. See my minimum due is $250 and Midland is responsible for $1250. I’m confused about one part (attached). What other fees could I be responsible for? What other fees could I be responsible for? None since Midland won't arbitrate. They recently just refilled and I was served the papers today. It's for a GameStop (Community) credit card I opened back in 2014. The amount is for $935. Got an email regarding arbitration. Notice of intention to initiate arbitration from JAMS. See my minimum due is $250 and Midland is responsible for $1250. "...All other fees associated with this Arbitration shall be borne by the company/non-consumer party." @Yungskeeme Gosh, the suspense is killing me. @Brotherskeeper Same here! Still waiting on my decision. Not surprised at this outcome. Hey, great job! Does the settlement contain the terms you want? Honestly couldn’t do this without everyone’s help. Everyone was very positive even when I felt like I needed my hand held. The settlement states it will be dismissed with prejudice and account with marked as disputed. I rather have it say it’ll be deleted. Unless that means the same thing. Didn’t even get my decision for my motion. Didn’t pay the filing fee so I’m good.